Lord Bingo hosts a top selection of online Hi-Lo games. 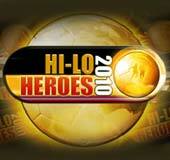 Players can pick from the best Hi Lo games like World Champion Hi-Lo, Hi-Lo Heros 2010, Aces High Hi Lo and more. You can also review & play for free directly on Lord Bingo before play for real cash!